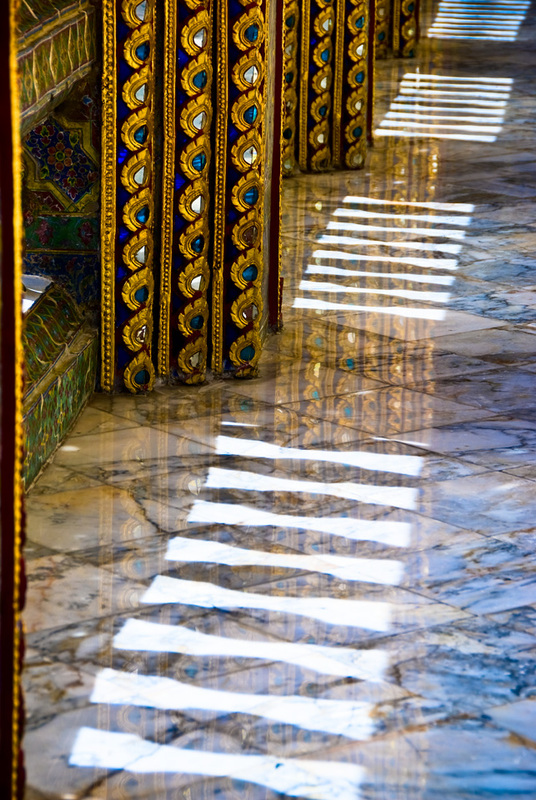 This image of patterns and reflections at Wat Rajabophit, Bangkok, Thailand, comes from Taiger808’s photostream. The temple was constructed in 1869 under the command of King Rama V.
While we’re on the subject of Indonesian ritual, here is an image of a Kechak dance from www.viajar24h.com’ s photostream. This dance tells stories from the Ramayana myth. One of its features is a large chorus of young men, said to represent a forest full of monkeys. The men provide the music for the performance by making percussive sounds. According to legend, Ken Arok, founder of the 13th-century Hindu-Buddhist Singosari kingdom, won his throne through a series of murders accomplished with a wavy dagger called a kris. Ken Arok’s dagger was powerful but it was also cursed, and ultimately it also killed its owner. In Indonesian trance rituals, celebrants in trance states may stab themselves with krises. 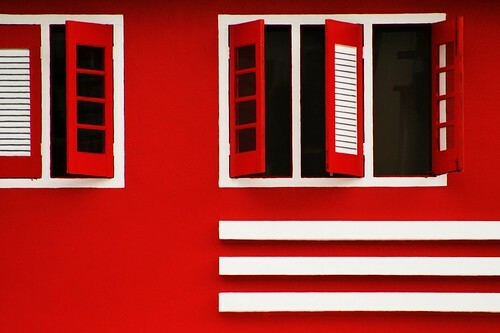 (Krises are also found in Malaysia, Brunei, Southern Thailand and the southern Philippines.) I think the stabbing is mostly symbolic, as several observers report they result in little or no blood. A couple of people were asking for more images of Indonesian jester puppets. Here’s another one from the Asian Art Museum (where the puppets are difficult to photograph because they are displayed in very low light). His name is Togog. Earlier I posted an image of the jester Semar. There is more information about Indonesian clown puppets at the Museum of Folly. The jester Togog, ca. 1800-1900. Ondonesia; Bandung, West Java. Wood cloth, and mixed media. Asian Art Museum; From the Mimi and John Herbert Collection, F2000.85.33.